Do you believe that bigger is better? While this may not always be the case, bigger can sure make things more interesting! Take cabins, for example. 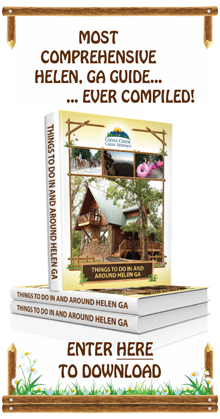 Most of us would feel that we had plenty of space to relax and unwind inside of a 2 or 3 bedroom cabin rental, but there are those out there who are always looking to take things to the next level. For these types of people, size matters. It's a symbol of prestige, and it allows them to stand out from the crowd. Just take a look at some of the largest log cabins in history, and in the world today, and you'll see exactly what me mean. These incredible structures are sure to absolutely blow you away. Situated on one of the very last surviving land grants that were made by 17th-century French Kings, the Fiarmont le Chateau Montebello is truly the most spectacular "log cabin" hotel & resort in all of Canada. For those traveling to Quebec, a visit to what Margaret Thatcher referred to as "The largest log cabin in the world" is an absolute must. The structure was built in 1930, with construction and woodworking teams working around the clock to complete the project in just four months - an incredible feat, considering its size. The "cabin" features 211 guest rooms, a ballroom, a dining room, and 17,000 square feet of meeting space. All of this is situated around a gorgeous hexagonal rotunda which houses a six-sided stone fireplace that can be viewed from mezzanines surrounding it. Although the structure is painted black on the outside, the natural woodwork and logs can be viewed from inside, and all in all, the building is truly a magnificent sight to behold. Timber Moose Lodge You don't have to leave American soil in order to see a huge log cabin. Located in Herber City, Utah, Timber Moose Lodge's claim to fame is that it is the largest private log cabin in the entire United States. In fact, the cabin offers over 26,000 square feet of living space, with 13 bedrooms and 16 bathrooms. If you ever need a log cabin to sleep 44-60 individual people, Timber Moos is the place to go. In addition to providing a place for massive groups to lay their heads, the lodge has an indoor swimming pool, a sauna, and 9,000 square feet of outdoor decks and balconies. From atop a hill, the lofty cabin can be seen from miles away, and offers some truly incredible views to those who choose to stay there. A crows nest viewing room that is 50 feet above ground offers a 360 degree look at the mountains and valleys surrounding Timber Moose. "Eighth Wonder of the World" You've got to see this one to believe it. It may have started out as a 2 story chalet, but, out of an obsession for topping his neighbor's homes, former gangster Nikolai Sutyagin converted the structure into the tallest log cabin in the world. Featuring 13 stories - half the size of Big Ben, this Arkhangelsk, Russia cabin was viewed as an eyesore by local residents - until it burned to the ground in a May, 2012 fire. World Forestry Center Canada may be home to the world's largest log cabin now, but until 1964, it was located right here in the United States. The cabin, known here as the World Forestry Center, was the final building to survive from the 1905 Lewis and Clark Exposition in Portland, Oregon. The huge building measured a whopping 206x102 feet which is just shy of a half an acre in size. In order to construct the cabin, an entire million board feet of lumber was utilized. After the exposition, the city of Portland bought the structure, and for years it simply sat unused, and laid to waste. By 1950, locals began to realize who irreplaceable the building was, and a collection was taken to restore it to its former beauty by the state's 1959 sesquicentennial celebration. But while this goal was accomplished, the cabin was unfortunately lost to a fire on August 17, 1964. *Bonus*: The World's Largest Treehouse Huge cabins are kooky enough, but the world's largest treehouse takes the cake. 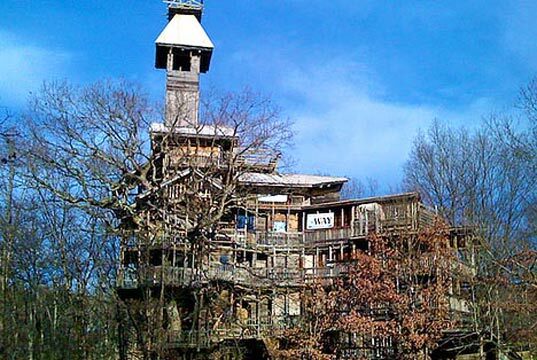 Also referred to as "The Minister's Treehouse", this incredible structure flows through the trees of Crossville, Tennessee. As the story goes, a retired minister believes that he was called by God to construct a treehouse to the exact specifications of the Lord himself. Featuring winding stairways, tall towers, numerous viewing decks, and a chapel, the treehouse is really something else. Bigger may not always be better, but it sure knows how to spice things up. Structures like these are sure to impress most anyone. Which of these impressive and humongous cabins appeals to you the most?